Tent encampments are proliferating in San Francisco, causing serious concern and significant debate. 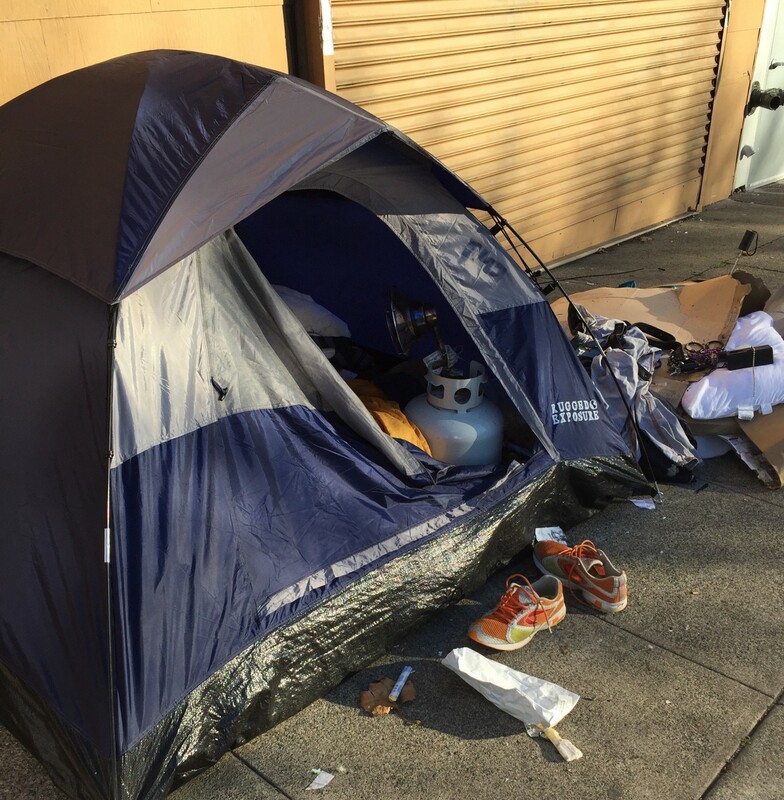 At the same time, San Francisco government is gripped with a deer-in-the-headlights inertia that allows the tents to become established and to grow in number. Permitting these encampments is neither humane nor progressive. The tents are a potent symbol of our city’s failure to deal effectively with homelessness, mental illness, and drug addiction — problems that manifest on our streets every single day as we observe bizarre and aggressive behavior, syringes and feces strewn all over, and other behaviors that degrade our community’s quality of life. Yet, regardless of the cause, these tents are not — and must not become, through inertia and lack of political will — permanent “housing.” We must have the will to transition people out of these tents into shelter and housing and to ensure that the tents reduce and disappear. Let’s be clear: tents on sidewalks are not housing. They are incredibly inhumane. They are unhealthy, unsanitary, and unsafe, both for the occupants of the tents and for surrounding neighborhoods. Anyone who has been in or around these encampments can verify that statement. Frequently observed around the tent encampments are feces, syringes, rats, and other unsanitary conditions. Occupants of the tents have been assaulted in the tents. Predatory drug dealers are drawn to the tents and victimize the occupants. Residents, passersby, and businesses around the tent encampments have reported various crimes, from assaults on people working or volunteering at the SPCA to numerous crime observations by employees of Rainbow Grocery to bicycle chop shops. People walking by the encampments have, at times, had to step into the street and moving traffic since there is no space on the sidewalk to walk. The occupants of these tents must be transitioned into shelter — now — and the status quo is completely unacceptable and inhumane. If we fail to do so, then we risk these tent encampments becoming permanent. With time, the public will become used to the tents and numb about them. Inertia will set in, and San Francisco will back into an unofficial “tents as housing” policy. Indeed, some advocates are already making the argument that tents are housing and that people have a right to claim a portion of the sidewalk for a tent house. Some have even told me that “shelters are for animals, not for people.” I disagree, and we as a city need to vocally dispute such defeatist and extreme claims. I recently sent a letter to six city departments — Human Services Agency, Department of Public Health, Police Department, Fire Department, Department of Public Works, and Mayor’s Office — asking for data about the tents and for a plan to transition people out of the tents into shelter and for the tents to go away. I asked, among other things, for data about the number of tents and number of occupants, information about who is living in the tents and what efforts are being made to offer them services, timetables for expanding our shelter system, and how the departments intend to transition people from the tents into shelter and housing, and in the process eliminate the tent encampments rather than allowing them to remain. And, to be clear, removing the tents is part of the process. It’s not good enough to offer shelter and then sit on our collective hands as people refuse shelter. Tents on sidewalks are not an option. Period. After I sent this letter, the response from certain homeless advocates was predictable. They called the letter cruel, mean, and every other name in the book. They dusted off the mantra that anyone who dares to have an opinion that individuals shouldn’t take over public space — and that shelter is preferable to encampments — is “criminalizing” the homeless. Imagine that: according to these self-appointed advocates for the homeless, it’s “cruel” to even ask what the plan is to transition people out of unsanitary and unsafe tents into shelter and housing. What’s cruel and inhumane is to allow people to remain in these tents. What’s cruel is to continue to allow people to deteriorate and die on our streets. Our street population has many needs. While San Francisco housed nearly 12,000 homeless people in permanent housing between 2004 and 2014, we need more housing for the homeless, and we are creating that housing. We need more shelter capacity and more navigation centers. The City recently opened up a new shelter at Pier 80. Unfortunately, it’s not yet full. We need more mental health services, and we are now moving toward building a mental health facility under the leadership of Supervisor London Breed, which is a very positive step. And, we need to continue San Francisco’s aggressive push to treat drug addiction and to help people get off drugs and get healthy. All of this work is critical, and I fully support it. Indeed, over the past five years, the Mayor and Board of Supervisors have increased funding for homeless services by approximately 50%, to a quarter billion dollars annually. Mayor Lee is now moving toward a consolidated, more efficient city agency to oversee all work around homelessness, and Supervisor Mark Farrell is seeking ways to expand resources available for housing. Yet, the needs that we are addressing and continue to face do not excuse turning a blind eye to these inhumane, unsafe, unsanitary, unhealthy, and, yes, cruel tent cities. Tents on our sidewalks are not housing, and we must avoid making them a part of our housing policy through official neglect and inaction.The tents need to go.